The finishing layer in indirect, flemish painting methods. This is your final finishing layer for your painting. Here you will put on your final touches, signature and after painting has dried, the varnish coat. 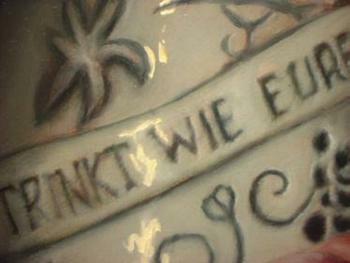 Below you see a close up of the wine jug. It has already had it's final color coats (not much really except for some touch ups from the dead layer and a deep blue accents pushed a little deeper by adding in additional ultramarine blue to the lines. I come back in with small dabs of white/yellow mixture of paint. It is applied thickly with little medium. I then used a very small correcting brush and finally a few wisps of the mop brush. These softened out nicely. As it is a clay (fired) piece, it's highlights are not as sharp and the dew drops or reflection off of chrome or glass. 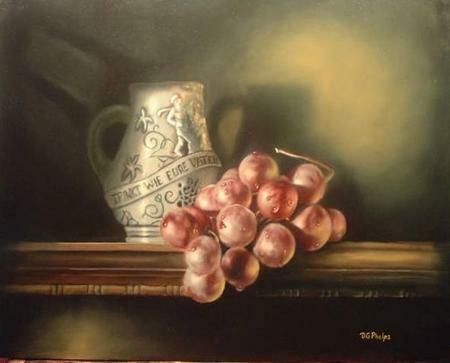 Here I have finished the grapes, but have shot some closeups to show the details. 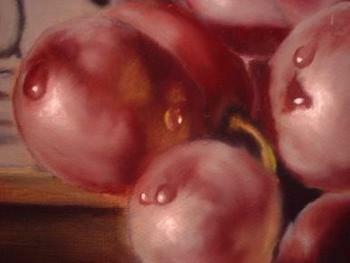 On each grape in the final finishing layer I have added certain detail. On the right side is a touch of yellow/red or orange that simulates a secondary light source. This is in addition to the main light from the left. Remember, no two grapes are the same. Each has it's own character! Also notice that a great deal of the dead layer show through on each grape. This mimics the gray dusty coating on fresh grapes that is usually wiped away in handling or from dew drops dripping down the skin. 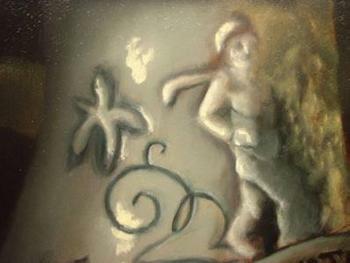 Below is the completed finishing-layer of the painting. I've added some lighter area's to the background to simulate a window frame. And of coarse the signature on the bottom. And here is the 2nd painting used for our examples. Both of these paintings I considered successful. Why? Quite simple actually. They both sold within a few weeks of completion! It's said that the greatest compliment an artist can receive is when someone takes out that hard earned cash, and gives it to the artist for something that has no real intrinsic value other than for pleasure for the eyes! I'm thankful for the many people that view this work as having value. May your travels be filled with people that wonder at your work also. 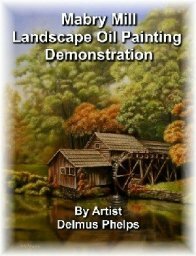 Keep within these steps, and you will succeed at this craft we call Oil Painting! 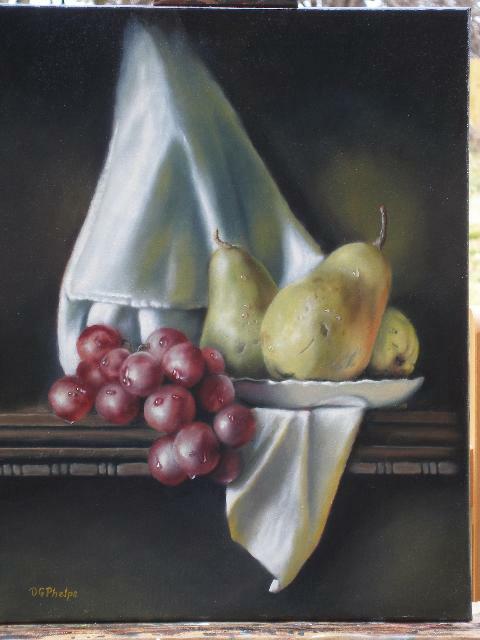 After you've allowed your painting to dry you can put a protective varnish coat (allow at least 6 months). If you used damar varnish in you medium, then you will need to wait several months to allow full drying of the painting. Damar varnish is then brushed on with a large flat brush then laid down to allow the varnish to settle to an even coat. Keep your painting covered with a box to keep dust from settling on it also. If you used the Alkyd medium in your mixtures, you need to wait but a few days. You can then use a damar varnish or some of the newer senthetic varnishes that have come along. These are wonderful and are not only easy to apply, but clean up easy with OMS. Most instructions have you lay the painting flat until the varnish is dried. The synthetics dry so fast, within a few minutes, I then will lean the painting against a wall (paint side towards the wall) to dry and prevent dust from settling onto it. One thing I'll add here. 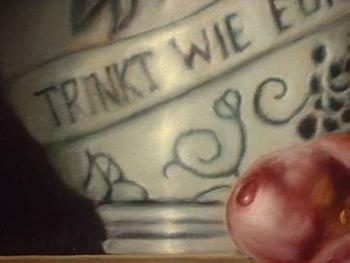 This is the part of the painting in which you complete "texture", not just details. These usually are your highest highlights, and deepest shadow glazes. It is usually done with your finest and smallest brush. And in some cases, 20 minutes of your time is all that is required. Now didn't I tell you that each layer gets easier. The finishing layer is a very quick final application of highlights, a few water drops, and your signature. It's always a good day in my studio, because I usually have several pieces in the pipeline that end up be completed on the same day. My gallery owner loves this because her clients love choices! If you've enjoyed these lessons, but you feel you need more, then check out the e-book, or the DVD movie demonstration of the entire process. You'll be pleasantly surprised at how affordable they are. Just click on the image! Back to the top of our finishing layer page.